Dar es Salaam — President John Magufuli has sacked and recalled Tanzanian High Commissioner to Canada Alphayo Kitada with affect from Monday, November 5. The statement issued by the permanent secretary in the Ministry of Foreign Affairs and East African cooperation, Dr Faraji Mnyepe, on Thursday November 8, also added that Mr Kadata's diplomatic status has been revoked. Mr Kidata was appointed Tanzanian High Commissioner to Canada on January 10, this year, after having served shortly as the permanent secretary at State House. 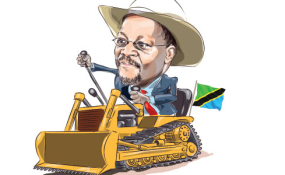 He also served as the Commissioner General of the Tanzania Revenue Authority (TRA) and permanent secretary at the Ministry of Lands, Housing and Human Settlements Development. Mr Kadata becomes the first ambassador to be sacked and having his diplomatic status revoked since the current administration came to office three years ago.